One of the larger costs for buyers when buying real estate is buying title insurance. Buyers, especially first time home buyers, often wonder what it is and if it is truly necessary. The answer to that last part is a resounding YES! 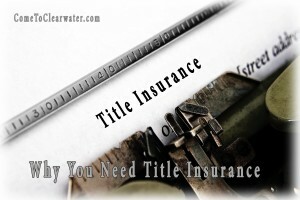 Title insurance is an insurance policy that protects the owner of the policy if there is a defect found in the title, or ownership, of the property. While it would seem that looking at the ownership history of a piece of property is a simple thing, there can be many things that complicate it. Some examples? Well, what if a mortgage that was recorded against the property was never shown as paid in full? Or if a tax bill was paid, but never taken off the record? What if several decades ago someone wrote down a property line wrong on an older deed? All of these things can complicate the title, and if it isn’t cleared up, you could lose your real estate. All of these issues cause something called a “cloud” on the title. Title insurance protects the policy owner against the costs of getting rid of that cloud. There are two types of title insurance, lenders’ and owners’. The lenders policy protects your bank or mortgage company. They have a vested interest in making sure that the title is clear. In the event that you default on the mortgage, they will eventually be the owners of the property and will have to sell it. They can’t sell a property with a cloud on the title. The lenders policy will usually be in the original amount of the mortgage. If there is a claim, the policy will pay out up to the amount the lender is out, the original mortgage amount, and pay off the mortgage. The benefit to you is that you won’t owe your bank a dime if you lose in court. The owners policy is for you, the deeded owner to the property. This policy does a few things. First it protects over and above the lender’s coverage. Second, it protects you once the mortgage is paid off. The owners’ policy stays with you, the owner. Mortgage companies or banks will require a lender’s policy, but purchasing an owners policy is a good idea. Protecting your interest over and above the lender is smart! Want more? Check out our post In A Clearwater Real Estate Transaction Who Pays For What?